Lama Zopa Rinpoche gave this teaching to about fifty ordained Sangha during a visit to a giant shopping mall in Kuala Lumpur, Malaysia, in April 2016. Lama Zopa Rinpoche gave this teaching to about fifty ordained Sangha during a visit to a giant shopping mall in Kuala Lumpur, Malaysia, in April 2016. Edited by Gordon McDougall. Rinpoche was in Kuala Lumpur during a teaching tour of Southeast Asia in 2016. Video recordings from the tour are freely available on FPMT’s Rinpoche Available Now page. Think of the five aggregates: [form, feeling, discriminative awareness, compositional factors and consciousness]. Be mindful of how you label the aggregates, how in the beginning they are just merely labeled. Watch that. In the next second the “I” is supposed to appear back to you merely labeled by the mind. That is what happens in reality, but that doesn’t happen. The “I” is merely labeled by mind but it only appears like that to a buddha because buddhas don’t have even the subtle negative imprints—the obscurations to knowledge (Tib: she-drip)—left by the ignorance holding the “I” as truly existent. Having totally purified these, these have ceased [in a buddha’s mindstream]. There is no dualistic view, no hallucination, no projection when the “I” and all phenomena appear as truly existing from their own side, as real. A buddha does not have this hallucination at all. You have to understand that. What appears to a buddha is what is merely labeled by the mind. But for us ordinary sentient beings, in the next second [Rinpoche snaps his fingers], it appears back not merely labeled by the mind. It appears back as the total opposite of that. That, in the Prasangika view, is the gag-cha, the object to be refuted. According to the Prasangika Madhyamaka, the second [subschool] of the Madhyamaka, gag-cha, the object to be refuted, is the total opposite to that; it appears back to you as not merely labeled by the mind. The real “I” that appears to you is the subtle gag-cha. The Svatantrika subschool’s view is grosser. For them it appears as not labeled by mind and existing from its own side. Before I said “not merely labeled” but here it is not even labeled by the mind. They see the “I” that appears to you as truly existing from its own side, as real. It is much grosser. Also, there’s the Mind Only school. They say the real “I” exists without depending on the imprints left on the seventh consciousness, [the mind basis of all, Skt: alaya vijnana], from which both subject and object arise. According to the lower schools, what is one hundred percent to be abandoned is believing that the “I” truly exists and is self-sufficient and independent, that is to say, independent of other things such as the aggregates. That’s the very gross wrong view to be refuted. The “I” appears to us as permanent, existing alone [unitary] and independent. When the “I” appears to you, all this is there. This way that the “I” appears to you is extremely gross. It’s the grossest hallucination. This is what is believed in Hinduism and for them this is the right view. For us, however, the way the “I” appears is the wrong view. So, you see how all the other schools’ views of what gag-cha is—how the “I” appears to us—are to be totally abandoned as they are all the wrong view. When you walk, there’s one meditation you can do. Everything, even subtle things, should appear merely labeled by mind—the “I,” action, object, everything. But, that doesn’t happen for us sentient beings. They do not appear not merely labeled by mind, even when you go to the supermarket. Whatever you look at—all these forms, all these many thousands and millions of things: the sky, the road, the people—all appear to you according to the wrong views described by all those schools. Meditate on that. If you can recognize even what’s asserted by the lower schools, gradually you can recognize the wrong views to be refuted by Madhyamaka schools, first the Svatantrika’s and then the Prasangika’s. You’re illusioned by your ignorance. The magician is ignorance; you are the audience. All this is an illusion. I’m sitting here, you’re sitting there. We’re here having tea, but all of this is illusioned as real – —real “I,” real restaurant, real tea, real snacks. All the rest is the same, appearing real. Recognize all the wrong views, that in the end, all these are like hallucinations. You’re walking and you hallucinate the “I,” you hallucinate the action of walking, you hallucinate the road, you hallucinate the car, you hallucinate the building. The other way to see it is as like a dream. Everything you look at is like a dream. You walk and you talk but [at the same time] the mind is practicing mindfulness, seeing it all as like a dream. You walk, talk, eat and so forth, but the most important thing is to recognize that this is all like a dream, like a hallucination, like an illusion, like a mirage. When you do that, attachment doesn’t arise, anger doesn’t arise. There is no reason for anger or attachment to arise. That’s how it becomes the antidote to samsara, the antidote to ignorance. 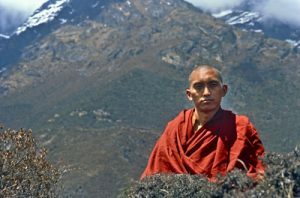 Then, if it’s done with bodhicitta, thinking, “I must achieve enlightenment to benefit sentient beings, to free them from the oceans of samsara and bring them to enlightenment,” it becomes the cause of enlightenment.